This article is about the 1975 Amicus Productions film. For the 2009 Asylum film, see The Land That Time Forgot (2009 film). The Land That Time Forgot is a 1975 British-American fantasy/adventure film based upon the 1918 novel The Land That Time Forgot by Edgar Rice Burroughs. The screenplay was written by Michael Moorcock and James Cawthorn and directed by Kevin Connor. The cast included Doug McClure, John McEnery, Keith Barron, Susan Penhaligon, Anthony Ainley and Declan Mulholland. The movie begins with a bottle with a written manuscript inside it being thrown into the sea, hoping for it to be discovered later. Floating to coast of England, a sailor discovers the bottle and opens to read the manuscript as Bowen Tyler (Doug McClure) narrates the events, much as we see in many Edgar Rice Burroughs novels. The story is set during World War I and involves the survivors of the sinking of a British merchant ship who are taken on board a German U-boat. Bowen Tyler and Lisa Clayton (Susan Penhaligon) are passengers on the ship torpedoed by Captain von Schoenvorts (John McEnery). Along with a few surviving British officers, Tyler convinces the other men to take over the surfacing submarine, this being their only chance for survival. After confronting the Germans on the deck, a fight ensues and they seize the German U-boat. Tyler takes command hoping to sail to a British port. Von Schoenvorts has his crew steer toward a safe sea port. But German officer Dietz (Anthony Ainley) gets loose and smashes the sub's radio. Off course and running out of fuel in the South Atlantic, the U-boat and its crew happen across an uncharted sub-continent called Caprona, a fantastical land of lush vegetation where dinosaurs still roam, co-existing with primitive man. There are also reserves of oil which, if the Germans and British can work together, can be refined and enable their escape from the island. Tyler discovers the secret of Caprona: individuals evolve not through natural selection, but by migrating northward across the island. With the submarine working again but a sudden outbreak of volcanic eruptions across the island, Dietz starts a mutiny and shoots Captain von Schoenvorts to take command. Dietz abandons Tyler and Clayton in Caprona in an attempt to escape, but the U-Boat cannot function in the boiling waters and the crew is killed as it sinks. Tyler and Clayton are stranded and being the only survivors of their group, they are forced to move northwards. The movie ends with Tyler throwing the bottle, with the manuscript inside it, as seen in the beginning of the movie. 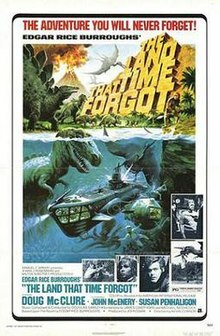 Amicus originally wanted to cast Doug McClure in the lead but he refused so they signed Stuart Whitman. Then Samuel Z. Arkoff of American International Pictures came on board as co-financers, providing the bulk of the budget, but would only make the film if McClure was cast. He changed his mind and agreed to do the film. Kevin Connor said "Doug was a great asset. In fight scenes he was especially good due to his hours of American TV action films. He knew exactly where the camera was at all times and threw punches precisely where the effect would work for the screen. He was always co-operative and came up with many ideas." Shooting began February 1974 and went for 16 weeks. Kevin Connor recalled, "The reason we went for the hand puppets was for a more fluid look. Roger Dicken, who created the dinosaurs did such fine details and had the movement down so well that we went with him and used that technique. Also, we developed the use of a small VistaVision camera to shoot the dinosaur back-ground plates which gave us great quality because the exposed frame is twice the size of a normal 35mm. Everything was shot front projection as well." The U-boat and ships were models and the dinosaurs and other prehistoric animals were puppets, hand-held or on strings rather than stop motion. The speaking part of Von Schoenvorts was later dubbed in post-production by German-born actor Anton Diffring. The Land That Time Forgot was met with mixed reviews from critics and audiences, earning a Rotten Tomatoes approval rating of 50%. The New York Times noted the film is "an initially agreeable picture about the discovery of a mystery realm where various stages of evolution coexist," but "the early virtues of "Land" collapse once the island is reached and the traffic jam in artificial monsters develops." The film was the 14th biggest hit at the British box office in 1975. On April 14, 2017, the film was featured in the eleventh season of Mystery Science Theater 3000. ^ "The Land That Time Forgot". American Film Institute. Retrieved 27 November 2015. ^ a b Jones-Morris, Ross (7 August 2012). "The Studio That Time Forgot – An Interview With Amicus Director Kevin Connor". Hey Guys. ^ Anon (August 14, 1975). "The Land That Time Forgot", The New York Times. Retrieved 2015-11-27.